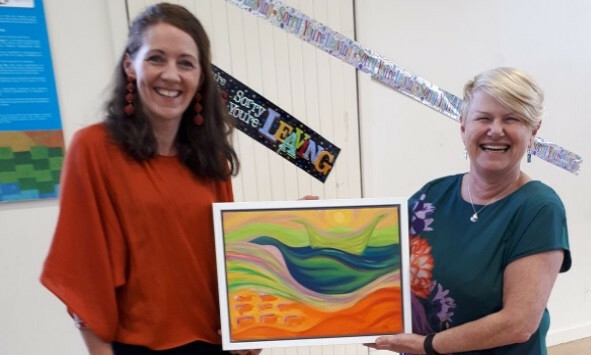 I have to admit I was excited and a bit nervous, when I was asked to create a special painting as a retirement gift, for Vice Principle, Rosemary McGonagle, on behalf of the parents of Le Cheile, Educate Together National School. I had the pleasure of knowing and on occasion, working with Rosemary. She's the kind of person who makes students and adults, shine brighter and feel lighter after spending any time in her company. I felt so honoured to have been entrusted with creating this retirement gift. It was exciting waiting to see Rosemary's face as the school students, teachers and parents gave her a surprise celebration, with presentations to show their heartfelt gratitude and appreciation. It was lovely to recently receive the following note from Rosemary, as she moves forward in new directions. "When I was presented with my painting as a retirement gift, I couldn’t believe this beautiful work of art was for me! It was bright and beautiful, and I felt incredibly emotional and grateful. I didn’t know at the time it was a soul drawing, yet I had immediately felt an amazing connection. On the day I was wearing clothes that were the same colours as the painting! On reading my letter I can only say that I felt truly blessed. The gift of the painting has reinforced for me how lucky I am and how rich my life has been, and is. As I now begin a new chapter in my life, the drawing continues to help me reflect as I navigate new ideas, projects and goals. When I look at the painting I feel a sense of confidence and a love of life and people, especially our precious children."